Eros International Media Ltd (EIML), a leading global company in the Indian film entertainment industry, has announced a co-production deal with Photon Kathaas Productions (“PKP”) for a Tamil film titled Yohan: Adhyayam Ondru (John: Chapter 1) starring Vijay. Produced in association with Future Film Production Ltd (UK Production), the film will be directed by Gautham Vasudev Menon with music by A R Rehman and is expected to commence production from Q2 2012. Yohan is the first of its kind (in South India) action thriller centering around a character that will be featured in a series of films (prequels and sequels). The film will be shot in international locations, predominantly in the United Kingdom with the active support of the UK government. The UK has a very favourable policy towards encouraging foreign film makers to shoot their films in the UK. Commenting on the development, Mr. Sunil Lulla, Managing Director, Eros International Media Ltd said, “Eros continues to make advances in the regional film markets and we are happy to associate with PKP and further expand our south repertoire. 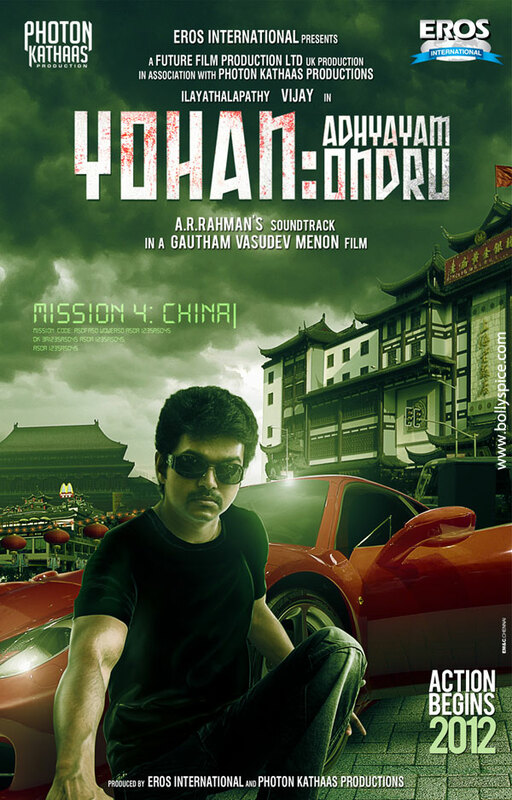 Yohan: Adhyayam Ondru promises to be one of its kind action thrillers by the very talented Gautham Menon”. Mr. Venkat Somasundaram, CEO, PKP added, “We are quite excited about the relationship with Eros. We believe this is the beginning of a long term relationship with Eros that will produce many successful films together”. “I am very excited about this project. Gautham and I have been talking about working together for a while and I’m glad that it’s finally materialized. Yohan is a totally new space for me and I’m sure my fans will love this action-thriller film. I am also excited about working with Photon Kathaas and Eros and am sure we will together create a landmark South Indian film”, said actor Vijay. Yohan is a landmark association between Eros –a leading global company in the Indian film entertainment industry and PKP – the first internationally listed South Indian film production company. 16 queries in 0.370 seconds.